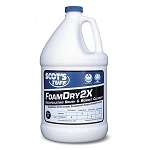 We carry a host of dry foam or low moister carpet cleaning chemicals. From a powder to a liquid we have them all. We feature such brands as Pros Choice, Core, Scot, and Capture. This method uses little to no water and is healthier for the indoor environment.